Rising dramatically from the coastal plains and elegantly perched at two adjacent hills, Udayagiri and Khandagiri Caves are located 6 km away from Bhubaneswar in Odisha. They are famous for religious value, artistic rock-cut architecture and historical significance. 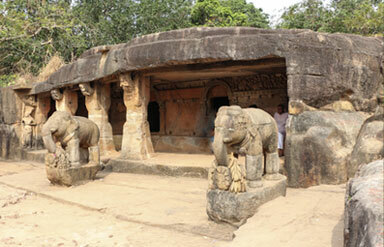 History of Udayagiri and Khandagiri Caves reveal that they were excavated during the reign of King Kharavela. Constructed primarily as residential blocks for Jain monks, these caves are embellished with carvings of women, elephants and even athletes. Orientalist James Prinsep had deciphered the Brahmi inscriptions carved on these caves. The Hathigumpha inscription still continues to be the main source of information. 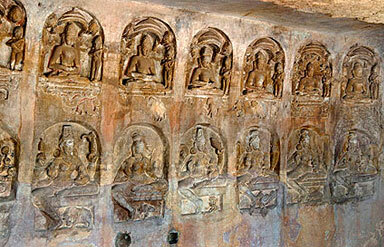 Udayagiri caves are 18 in number while Khandagiri is made of 15 caves. In the local context, ‘Udayagiri’ is also called as the ‘Sunrise hills’ while ‘Khandagiri’ means ‘Broken Hills.’ and bears the most interesting caves of all. One of the rock-cut shelters in Udayagiri caves; it gets its name from the figure of Lord Ganesha etched at its rear end. It has two cells with low ceilings and an outdoor porch or verandah in its front. The verandah has five pillars, out of which only three exist today. Standing figures of men and women elegantly holding flowers, vessels or trays can be spotted on the pillars. Each cell has two openings. The embellishments are in the form of pillars. The upper-case of the pillar projects carvings of pair of animals, flowers and creepers. This is the third cave, also called as ‘Ananta Gumpha.’ Its gets its name from the two serpents present of the arch of the door. The unique motifs of boy chasing wild animals or geese holding blue lotus in its bill, adds artistic charm to the cave. 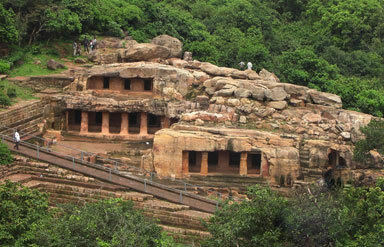 ‘Bagh Gumpha’ or Cave12 is also located midst Udayagiri Caves. The cave draws its name from the carving of ‘mouth of a tiger embellished at the front of the cave.’ One can spot the upper jaw with teeth as the roof of the cave and the gorge being the entrance. This is the 7th cave of Khandagiri and receives its name from the nine ‘Jain tirthankaras’ (liberated souls) carved at the back of its wall. Images of Lord Ganesha and Sasana Devi-the protector Goddess are also carved. Excursions from Udayagiri and Khandagiri Caves: Bhubaneswar (6km), Nandankanan Zoological Park (19km), Puri (62km) and Konark (66km) are some of the nearby getaways to explore. Air: Bhubaneswar Airport (8km) is the closest airport to the destination. Rail: Tourists can get down at Bhubaneswar Railway Station (10km) and take a cab or taxi for the caves. Road: Tourists can opt for bus, taxi or car to reach the site. So, get a rare chance to delve into the archaeological, religious and historical essence of Udayagiri and Khandagiri Cave Tour. Gear up!